p style=”text-align: justify;”> As we begin to prepare our hearts and minds for times of worship tomorrow, this message seems both timely and appropriate to the purpose. It was on this day, October 13th, in 1826, the Rev. Dr. Samuel Miller brought the following message at the installation of the Rev. 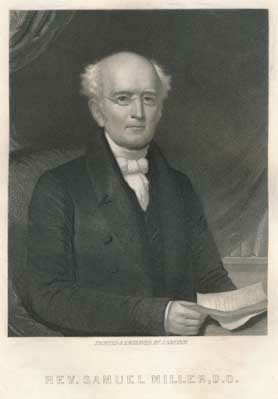 John Breckinridge as collegiate pastor of the Second Presbyterian Church in Baltimore. Reproduced here below will be the opening portion of the sermon, and if you would like to read the entire sermon, a link to an online edition will be provided at the end of this post. CHRISTIAN WEAPONS NOT CARNAL, BUT SPIRITUAL. For the weapons of our warfare are not carnal, but mighty through God to the pulling down of strong holds.—II Corinthians 10:4. As long as man retained his primitive innocence, he loved truth, and was ever ready to give it a cordial welcome. But the moment he fell from God and from holiness, truth became painful, and, of course, odious to him. He felt that he could no longer listen to it as a friend, speaking peace; but must henceforth regard it as an enemy, which could deliver no other than a hostile message. Accordingly, when we read that the holy and happy tenants of Eden had become rebels by eating the interdicted fruit, the next thing we read of is, that, on hearing the voice of the Lord God walking in the garden they hid themselves from the presence of the Lord among the trees of the garden. And the Lord called unto Adam, and said unto him, Where art thou? And he said, I heard thy voice in the garden, and I was afraid, and I hid myself. Of the truth of these remarks, we have a striking example in the history of the church of Corinth. The apostle Paul had laboured in the ministry of the Gospel in that city for a considerable time; and his labours had been crowed with success. Numbers were added to the professing people of God. Soon after he left them, however, a false teacher came among them, who appears, from various hints dropped by the apostle, to have been a man of honourable birth; of fine talents; of polished education; and of great skills in all the arts and refinements of Grecian eloquence. He was evidently, also, as such impostors commonly are, a man of lax principles; ever ready to accommodate his doctrines to the pride, the prejudices, and the corrupt passions of those whom he addressed. This artful deceiver, on the one hand, set himself with peculiar bitterness against the apostle; found fault with his birth and education; alleged that his bodily presence was mean, and his speech contemptible; and insinuated that he was really no apostle. On the other hand, he boasted much of his own origin, learning, eloquence, and other accomplishments, and endeavoured to persuade the people of Corinth that he was, in every respect, Paul’s superior. Unhappily, the situation of the Corinthian church at this time was peculiarly favourable to the views of such an impostor. In consequence of the surrounding wealth and luxury, and the remarkable exemption from persecution which it had for some time enjoyed; a large number of its members were deeply tinctured with a worldly spirit. In fact, the church there seems to have been full of professors who were far from having either the knowledge, the steadiness, or the spirituality which became them. No wonder, therefore, that this false teacher found admirers and followers. He raised a considerable party, which gave much trouble to the friends of truth, and which, for a time, threatened the peace, if not the existence of the church in that city. The inspired apostle, in the passage of which our text make a part, seems to be directly addressing this false teacher and his adherents, and repelling some of the insinuations which he had made against himself. In reply to the charges,–that he was destitute of the credentials of an apostle,–and that he had none of those decisive and energetic means of resisting opposers, and supporting his authority, which they supposed a teacher sent from God ought to exhibit; the apostle declares,–Though we walk in the flesh, that is, though we inhabit mortal bodies, and are compassed about with fleshly infirmities;–yet we do not war after the flesh–or according to the flesh. For the weapons of our warfare are not carnal, but might through God to the pulling down of strong holds. In the passage of holy scripture before us, there are two points which demand our particular notice, viz. II. The GREAT EFFICACY of those weapons : they were MIGHTY THROUGH GOD. I. Let us first contemplate the WEAPONS which the apostle speaks of himself as employing. The weapons of our warfare are not carnal. The word carnal means fleshly. It is opposed in scripture to spiritual or holy; and is generally employed by the inspired writers to designate the principles of our depraved nature. Thus, when it is said, that the carnal mind is enmity against God (Romans 8:7); and that to be carnally minded is death (Romans 8:6);–the language is evidently meant to express the dominion of that corrupt disposition which mean bring with them into the world, and on which the sanctifying grace of God has not yet taken effect. Of course, by the phrase, carnal weapons, is meant, such weapons as our corrupt nature forms and furnishes. In other words, it is intended to designate all those means of recommending and propagating religion which the great Author of that religion has not prescribed, but which the wisdom of this world has invented. Such weapons have been employed in all ages. They are the favourite weapons of carnal men : or rather, they are the only weapons which such men are either qualified or disposed to employ. But they are not confined to carnal men. Even some of those who sincerely love the Saviour, may be, and have been, betrayed into the use of means for promoting his honour, which may well deserve to be styled carnal, and which, in themselves, are not less carnal, or the less criminal, because they are employed by good men. In short, every method, of propagating truth, or of recommending duty, either real or supposed,–which unhallowed principles suggest, or unhallowed motives prompt, or which, in one word, is not in conformity with the Word and Spirit of God, may be pronounced a carnal weapon, the use of which our text indirectly, but most solemnly, forbids. But it may not be unprofitable to specify, a little more in detail, some of those means which are frequently resorted to, for the professed purpose of propagating religion, and which evidently belong to the class proscribed by the apostle in the passage before us. And at the head of the list, may be placed PERSECUTION, whether in its more gross and violent, or in its more mitigated forms. By the former, you will readily understand to be meant all those cases in which the “secular arm” has interfered to enforce the claims of a particular religious denomination, or of a particular set of opinions, by fire and sword,–by fines and forfeitures,–by racks and chains, and banishment, and all the various penalties which oppressive governments, civil and ecclesiastical, have so often, and so grievously inflicted. By the latter are intended all that molestation, abuse, or temporal inconvenience, of whatever kind, which have been heaped upon men on account of their religious opinions. The narrative of these inflictions, and of the diabolical fury with which they have, in countless instances, been executed, forms one of the most melancholy chapters in the history of that which calls itself the Church of God. A narrative the more unspeakably revolting, from the fact, that the most shocking atrocities which it displays, were perpetrated in the name, and by the alleged authority, of a God of mercy, and from a professed regard to his glory! Before this enlightened audience I need not say, that persecution for conscience sake, in all its forms, is one of the greatest absurdities and abominations that ever disgraced the Christian world :–that it is contrary to reason, to justice, and to humanity, and certainly not less contrary to the word of God, and to all the radical principles of our holy religion. To the same interdicted class of weapons, we may refer all CIVIL ESTABLISHMENTS OF RELIGION. Whatever may be their form, or the degree of their rigour : whether they are intended to operate by force, by fear, or by allurement : whether we consider them as a tax on error, or as a bounty on faith; as a legal provision for instructing the people in what the civil magistrate (who may be an infidel or a heretic) chooses to say is truth; or as a convenient engine in the hands of government, for reaching and controlling the popular mind : in all cases, they are unhallowed in their principles, and pernicious in their tendency : calculated to generate and encourage hypocrisy; to corrupt the Christian ministry; to make the care of souls an affair of secular merchandise; and to prostrate the church of God, with all its officers and ordinances, at the feet of worldly politicians. Again; all HUMAN INVENTIONS IN THE WORSHIP OF GOD are liable to the same general charge. The object of these, in every age, has been to consult carnal prejudices, and to accommodate carnal feelings : of course, they are carnal weapons. When, therefore, professing Christians began, soon after the apostolic age, to introduce into the church rites which the Saviour never instituted, for the purpose of assuaging the enmity, or conciliating the affections of Jews and Pagans : when they borrowed, from either or from both, without scruple, and without the smallest warrant, as they fancied an inducement—the smoking incense; the worshipping toward the East; the bowings; the adoration of images; the purgatorial fire; the merit of bodily maceration; the celibacy of the clergy; the splendid garments; the holy days; the exorcisms; the processions, and all the endless array of superstition; insomuch that, as early as the close of the fourth century, the venerable Augustine complained that, “For one institution of God’s they had ten of man’s, and that the presumptuous devices of men were more rigorously pressed than the Divine prescriptions;”–who can doubt that they were chargeable with employing carnal weapons? And when Christian churches or individuals, at the present day, aim to allure the gay and the worldly, by pomp and splendour of ceremonial, by that studied address to the senses in the public service of the sanctuary, which the primitive and purest periods of Christianity never knew; who can doubt that they also lay themselves open to the same charge? They undertake to be wiser than God; they employ means, which, however well intended, can result in nothing but mischief. The church has no power to “decree rites and ceremonies.” If she had, there would be no other bounds to the multiplication of them, than the every varying, and ever teeming figments of human vanity or caprice. To claim such a right, is rebellion against her Master. To exercise it, is systematically to introduce superstition and complicated corruption into his sacred family. Further; even ECCLESIASTICAL CONFESSIONS AND FORMULARIES may be so perverted as to become carnal weapons. Christian Weapons Not Carnal But Spiritual: A Sermon, delivered in the Second Presbyterian Church, in the City of Baltimore, October 13, 1826; at The Installation of The Reverend John Breckinridge, as Colleague with the Reverend John Glendy, D.D. in the Pastoral Charge of the Said Church.